Our Psychology course is accredited by the British Psychological Society. Graduates can progress in to a range of careers and further education, including roles within the NHS, prison service, education authorities and more. Psychology at the University of Suffolk at our main campus in Ipswich is accredited by the British Psychological Society. Students who wish to become professional psychologists are eligible for Graduate Basis of Chartered Membership of the British Psychological Society, providing that they gain a minimum of second class honours and have completed all the required psychology modules. Contemporary Psychology is a scientific discipline dealing with human behaviour, cognition and action. In Psychology at the University of Suffolk you will explore and examine the interaction between mind and behaviour, the nature of the unconscious, the functioning of memory, individual behaviour in social situations, prejudice and altruism. Students studying criminology at the University of Suffolk will be challenged to seek answers to fundamental questions. Psychology and Criminology student, Emma, talks about her experience joining us through Clearing. Watch her story below. Further information about the University's relationship with the British Psychological Society (BPS) is available in the PSRB register. Level 4 All Mandatory Psychology and Criminology Modules Plus 2 optional module from the level 4 (Year 1) options below. Level 5 All Mandatory Psychology and Criminology Modules Plus 1 optional module from the level 5 (Year 2) options below. Level 6 All Mandatory Psychology and Criminology Modules Plus 2 optional module from the level 6 (Year 3) options below. Foundations in Biological and Cognitive Psychology is a mandatory module for all students taking a psychology degree route. Together with the “Foundations in Social and Developmental Psychology” module, level 4 students will attain a holistic underpinning to the major approaches in psychology. The module will cover conceptual and historical issues of behavioural, biological and cognitive approaches to psychology. Social Psychology is concerned with the scientific study of human social behaviour, experience and thought. Developmental Psychology is concerned with the scientific study of systematic changes in human psychology across an individual’s lifespan, particularly cognitive, perceptual, social and emotional development in childhood, adolescence and adulthood. This module provides an introduction to key theories and approaches in Social and Developmental Psychology. Biological psychology (biopsychology) looks at psychological processes from a biological perspective, dealing with issues such as behaviour genetics, endocrinology and physiological psychology. Cognitive psychology studies how information is processed by the brain and sense organs. It is concerned with issues of how people perceive, understand, make decisions about and remember information. This module will build on the broad introduction at Level 4 and seek to provide research-based accounts of social and developmental behaviour in key areas, such as people in groups, prejudice and discrimination, aggression, social influence, emotional and social development, life-span adult development and developmental social psychology. This module builds upon the foundations laid in the module Introduction to Criminology and explores theoretical perspectives that influence criminology and social control. ‘Scientific’ theories of the nineteenth and early twentieth centuries were crucial to the construction of a new ‘common sense’, in which the solutions of social problems would be found - it was believed - in an applied science and technology of social order and control. Youth Crime and Justice aims to enable students to develop a critical understanding of the contemporary youth justice system through examining the main concerns and policies applied to young people in trouble with the law. Students will critically evaluate the impact of current legislation on youth justice services and identify and analyse themes on oppression and discrimination. The relationship between psychology and crime is an important area of study. The purpose of this module is to explore the ways in which psychology can be applied to criminology and to critically discuss the relationship between psychology and crime. The module examines the ways in which key approaches, perspectives, theories and debates in psychology can contribute to understanding criminal and deviant behaviour. The Policing module seeks to being together key areas of criminological inquiry and explore the role of policing. Students will develop an understanding of contemporary concerns such as antisocial behaviour and terrorism, and demonstrate the ways in which law has become a significant area of public concern. Criminal Justice aims to analyse the social, economic and political factors that underpin the policing, court, penal and probation institutions. Issues to be discussed include the implementation of legislation, the balance between due process and crime control and the impact of Human Rights legislation on criminal justice policy. Abnormal Psychology seeks to explain unusual or maladaptive behaviour through the examination of rigorous, research-based subject matter. The concept of ‘abnormal’ can be problematic given negative connotations with ‘not normal’ and this will be a key area of debate: the essence of normality and the appropriateness of labels which may have important ramifications for how people suffering psychopathology are in some way perceived as ‘not normal’ or as inferior members of society. Research is an important and integral part of your degree, and the Research Dissertation gives students the opportunity to expand learning and develop interests in a particular topic. Students will critique research by others and will reflect on their own work, moving students from a theoretical knowledge of research toward a more informed level of skill and application. Applied Studies allows students to explore in some depth an important book within their field of study relating to either psychology, sociology, youth studies or criminology. Students will critically review their book and evaluate how subsequent research in the field has developed in their own Book Review assignments. The purpose of the module is to critically analyse and evaluate theoretical justifications of punishment together with political ideology that impact upon penal policy and practice. This module considers both custodial and non-custodial punishment and a range of issues and dilemmas that might derive from these two key strategies of penal intervention. Victimology allows students to recognise the extent, patterns and impact of victimisation which is fundamental to enable informed discussion regarding crime and deviance. Through exploring the concept of victimisation, the experience of crime victims and developments in response to them, students will have the opportunity to broaden their understanding of contemporary crime and criminal justice. The most recent figures available from the Higher Education Statistics Agency(HESA) reveal that 85% of Psychology and Criminology graduates in 2014/15 found employment within six months of graduation. Around 60% of graduate jobs are open to graduates of any discipline and Psychology and Criminology graduates are well equipped with the advanced skills and confidence to thrive in a variety of occupations. Psychology and Criminology graduates are good at problem solving, have good analytical and research skills, and have excellent information and data management skills. Quite a number of our graduates also go on to pursue further qualifications at masters and doctoral levels. ''I studied Psychology and Criminology at the University of Suffolk. I found the course interesting and challenging. Lectures were informative and engaging, and seminars provided the opportunity to enhance learning through debate and class discussion. The programme has inspired me to pursue a career in a Social Science discipline. My next step is to progress to postgraduate study in a relevant area." While considering the most appropriate programme I have taken some time out from my studies and have been working for the university in Academic Support. This role has opened my eyes to the hard work that goes on behind the scenes. The course has changed my way of thinking and working. I'm therefore able to work more effectively. I can't wait to continue with further study, and I'm very grateful to the university lecturers for the support and encouragement they have given me in achieving my longer term objectives." 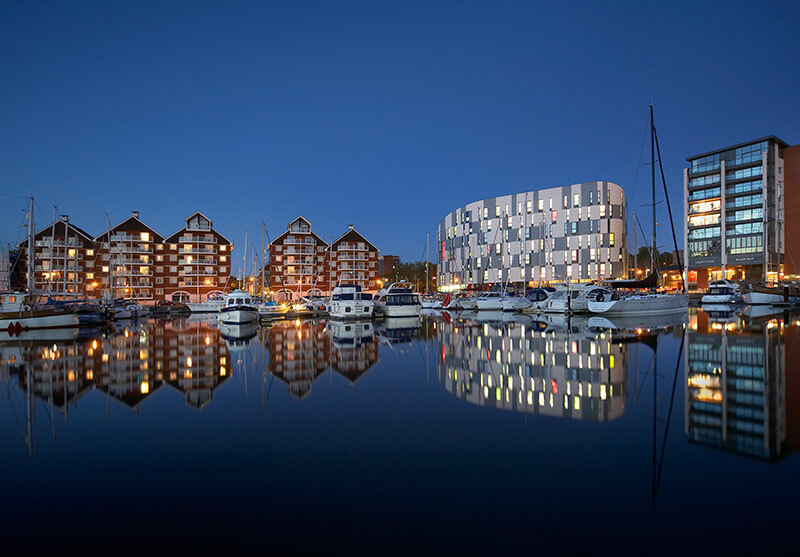 Psychology and Criminology teaching takes place at our modern, fully-equipped Waterfront or Atrium buildings at our Ipswich campus. As a University of Suffolk student, you will have full access to our well-stocked library in addition to discounts at our cafes and restaurants. If you are looking for a quiet place to work, our break-out areas on each floor of our Waterfront Building are an excellent choice. The Psychology and Criminology team has extensive links with all local agencies that operate within the field, and as such they are able to embed contemporary research into their teaching demonstrating the applied nature of psychology and criminology at the University of Suffolk.